Stylish desk and adjoining desk height pedestal in a choice of seven finishes and available for delivery in 7 - 10 days from order. Pedestal comes with an integrated pen tray and metal bow handles. 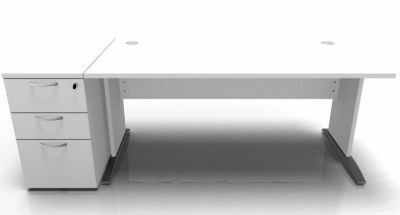 The leg frame also has two holes in the in the top and bottom of the leg allowing it to act as a cable riser allowing power and data cables to be discreetly hidden and brought to the desk surface. The desk tops of this office furniture range also include 80mm desk cable outlets. 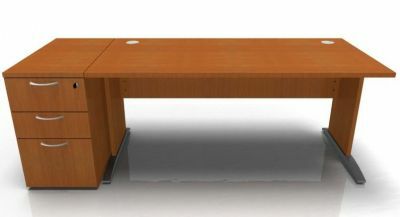 A PVC channel is also provided as standard to provide horizontal cable management.